I don't know, sounds like the darkened areas on Io, a bit. Pluto has an irregular orbit that takes it to very different areas of the solar system which might have very different electrical environments. However, it also takes its sweet time doing so, which might make the electrical effects very slight. Still, this could be some electrical burning, with Io as a good example. Last edited by nick c on Tue Sep 27, 2016 9:03 am, edited 1 time in total. 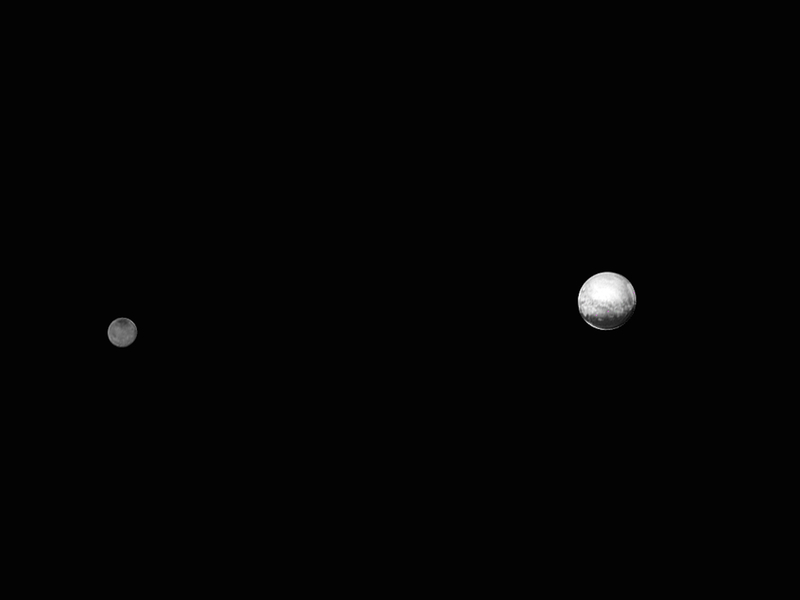 The New Horizons spacecraft is now about a year from a Pluto/Charon flyby. 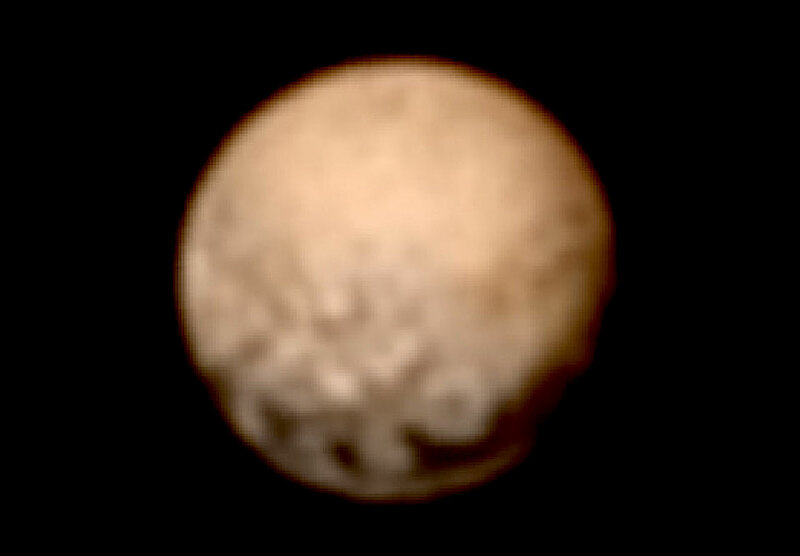 On July 14, 2015 astronomers will be treated to something that has never been seen, the surface of Pluto. Once classified as the ninth planet in the Solar System until 2006, when a vote from the International Astronomical Union determined that it more closely resembled other objects called “dwarf planets”. Dwarf planets are considered to be a unique category: there are most likely hundreds of them in orbit beyond Pluto. The largest include such bodies as Ceres, Pluto, Charon (Pluto’s largest moon), Makemake, Varuna, Haumea, Quaoar, Orcus, Sedna, Eris, Snow White, Ixion, and Hyua. Many more are not named but are identified by number. The image at the top of the page is not a photograph. It was constructed from information collected by the Hubble Space Telescope. Hubble’s images were only a few pixels in size, so special algorithms were written and then run on parallel computing engines in order to extract the picture. 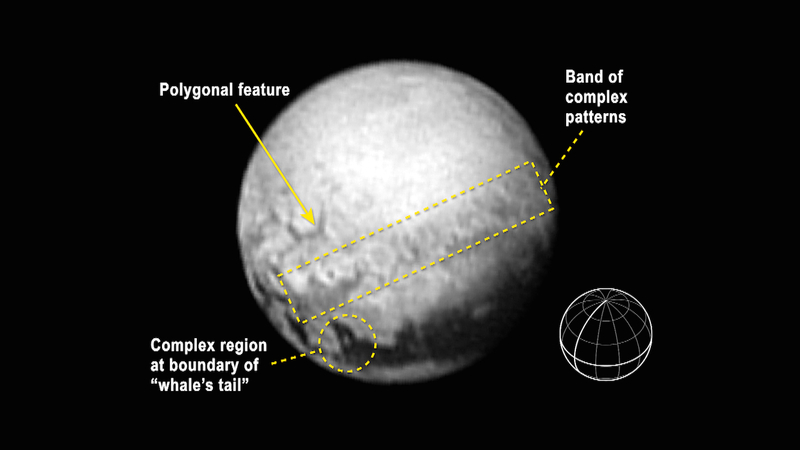 It remains to be seen whether the program was correct in its estimation of Pluto’s surface variations. Pluto’s mean distance from the Sun varies because it is in a highly eccentric orbit. Aphelion takes it out as far as 7.3 billion kilometers, while perihelion brings it no closer to the Sun than 4.4 billion kilometers, which means it takes about 248 years for it to complete one revolution, longer than telescopes have been able to observe it. To put the figure in perspective, the last time Pluto was in the same place in its orbit as it is now was ten years before the signing of the Declaration of Independence. Pluto has several moons: Charon is the largest, followed by Styx, Kerberos, Hydra, and Nix. There might be others too dim to see, so New Horizons could add to the count of 178 moons in the Solar System (a fourteenth moon around Neptune was discovered in 2013). Pluto is small, only about a third the mass of the Moon. It is thought to be similar in composition to most remote bodies, like Triton, composed primarily of rock and ice. No one is sure, at this point, what its chemical makeup really is. Hopefully, the The New Horizons instrument named Ralph, “a visible/near infrared multi-spectral imager and a short wavelength infrared spectral imager” will provide clues as the spacecraft flies by Pluto at a distance of 10,000 kilometers, at a speed of 11 kilometers per second. After its six month encounter period with Pluto, New Horizons will head out into the Kuiper Belt, where at least three other dwarf planets will be targeted. That mission will last from early 2016 until at least the year 2020. It will be so far away from Earth at that point that transmissions will require nearly 12 hours of travel time to be received. No one is sure what to expect, but Electric Universe proponents are confident that there will be confirmation of the theory, just as every other mission to the planets and moons has done. Ten days before its closest approach and, with the images that we've seen so far of the bright spots (possibly high electrical activity? ), it will be interesting to see what caused the probe’s “autonomous autopilot on board the spacecraft recognized a problem and – as it’s programmed to do in such a situation – switched from the main to the backup computer". Pluto is the charged finger, and New Horizons the curious cat's nose. Zap! Zap! — at 10M km away? Didn't you read about New Horizons returning to normal operations tomorrow? The computer was tasked with receiving a large command load at the same time it was engaged in compressing previous science data. The main computer responded precisely as it was programmed to do, by entering safe mode and switching to the backup computer. ...if anyone more knowledgeable in computer systems used on space probes could explain this in more detail, I'm curious how this planned-for situation could be allowed to happen in the first place. That is, I realize the computer on a deep space probe has many limitations in power and other system resources—especially when all of it must be designed to function for years. Back to the question: if the probe was designed to default to Safe Mode in this situation, it dumps both the incoming instructions, as well as the job being executed at the time. Why didn't the system give one task priority and, say, bounce back a message, "Sorry, I was busy at the time. Please repeat your message." Why was such a huge incoming message sent in the first place, unless the probe was behind schedule and mission controllers did not know the computer would be occupied at the time? Considering how precious the computing time must be, I would expect better scheduling of the resources. Suppose someone—for whatever reason—wanted to foul the mission at the critical moment and took advantage of this "switch to Safe Mode" behavior by DOS attacking the computer? Or are these stupid questions? clear dissymmetry which might be from electrical scarring. Charon: 2274 kilometers mean diameter. Pluto: 2368 kilometers mean diameter. I'd suggest that all rocky bodies in our field of view are electrically scarred, since planet/moon birth from stars and brown dwarf/gas giants presumes double layer phenomena and electrical parturition. That looks like a big plus sign, wannabet on other side being a minus sign ? What are your predictions for the flyby images? It will be quite a while untill we get input from New Horizons ? It will have dissimilar hemispheres. It will not have come from the same origin as Charon. It will be an active body due to its dynamic elliptical orbit and close family of moons.